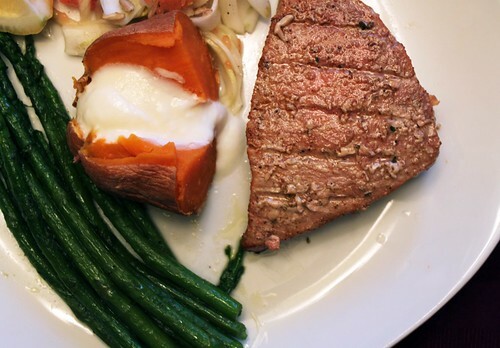 Slice the filet horizontally with a large sharp knife to create two 1-inch thick filets. Pat fish dry with paper towel and place in a shallow dish. Lightly sprinkle both sides of each filet with chili powder/seasoning, garlic powder, and unrefined salt. We chose to lightly season it to let the natural flavor of the tuna shine through; if you want to have a more aggressive flavor you may want to really go crazy with the chili powder. Cover dish and place in the refrigerator for at least 15 minutes, to allow flavors to penetrate the fish. You could grill it immediately if you're in a hurry, but the flavor will be less developed. If using wood chips to lightly smoke the food, about 30 minutes before you grill, soak your wood chips in a small bowl of water. After 30 minutes, drain wood chips and put in a small tin (an empty tuna can works great) or in a small tray made of aluminum foil. Place wood chip container on coals or over burner. 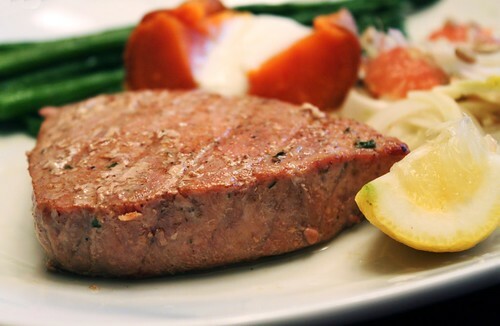 Start the fire or kick on the gas, and let your grill heat up to around 400º F.
Once grill is heated, lightly oil the grates and put on the tuna filets. Grill for 5-6 minutes on each side for a 1-inch thick steak. When done, meat should be firm and cooked through - don't overcook, or it will be dry!. 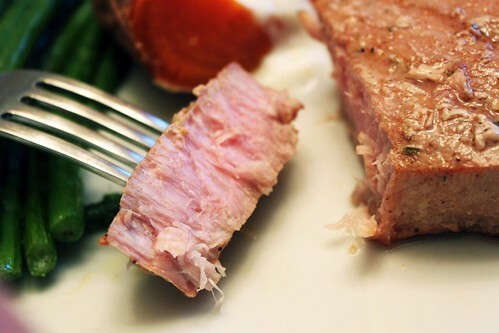 If you prefer it merely seared on the outside and still quite pink in the middle, then reduce grilling time to about 4 minutes on each side. Immediately remove tuna steaks from grill and let rest for for a few minutes, then serve immediately or chill and use for salads. Tuna is excellent drizzle with a little high-quality extra virgin olive oil and lemon. 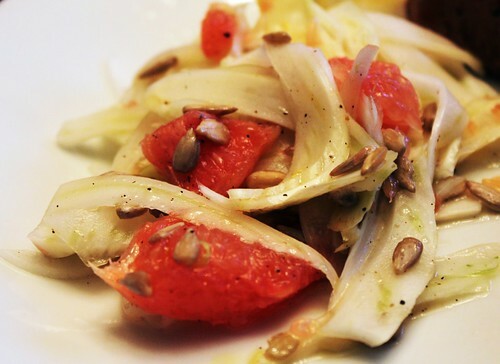 To make it a meal, add sauteed or roasted vegetables, a raw salad or slaw (like the Grapefruit-Fennel Salad below! ), and a grain pilaf or cooked sweet potatoes. Supreme the grapefruit with a small, sharp knife. If you have never done this before, check out this awesome tutorial - easy! Thinly slice the fennel bulband thinly slice the onion with a very sharp knife. Toss three ingredients together in a bowl, and drizzle with olive oil and season to taste with salt and pepper. Salad can be served immediately or chilled and served within 1 day. Sprinkle sunflower seeds over salad immediately before serving.